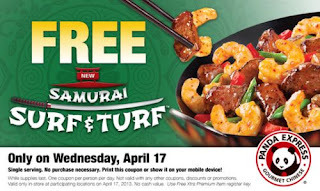 Free Samuri Surf & Turf at Panda Express April 17th, 2013. Click the link below to go to the coupon. Print the coupon and take it to your nearest Panda Express to redeem it.